The Lifestyle Expo in Dubai is being held to foster business collaboration between the Chinese mainland, Hong Kong and the United Arab Emirates (UAE) as well as the rest of the Middle East-Africa (MEA) region, helping companies seize the enormous business opportunities emerging from China’s Belt and Road Initiative and Expo 2020 Dubai.Jointly organised by the Hong Kong Trade Development Council (HKTDC) and the Trade Development Bureau of the Ministry of Commerce of the People’s Republic of China, the fifth edition of the Lifestyle Expo opened yesterday (25 September) and continues through today at the Hyatt Regency Dubai. Officiating guests include (from L to R) Li Lingbing, Consul General, Section of Consulate General of the People’s Republic of China in Dubai; Sun Chenghai, Director-General, Trade Development Bureau, Ministry of Commerce, People’s Republic of China; HE Abdullah Ahmed Al Saleh, Undersecretary of Foreign Trade and Industry, Ministry of Economy, UAE; Stephen Liang, Assistant Executive Director, HKTDC; Perry Fung, Regional Director (Middle East & Africa), HKTDC. The two-day event showcases a wide selection of trendy products from about 110 Hong Kong and mainland companies to an expected 1,300 buyers from the UAE, Iran and Africa. Exhibits include consumer electronics, information and communications technology (ICT) products, household products and electrical appliances, fashion and fashion accessories, gifts and premiums, as well as watches and clocks. Speaking at the Opening Ceremony, HKTDC Assistant Executive Director Stephen Liang highlighted the cooperation between the mainland, Hong Kong and the UAE to unlock opportunities arising from the Belt and Road Initiative, a key global economic driver for the 21st Century. He said such collaboration is especially important in view of the Belt and Road Initiative, which aims to connect markets in more than 60 countries spanning Asia, the Middle East, Africa and Europe, including Hong Kong and the UAE. These economies represent about 4.6 billion potential consumers and accounting for over 30 per cent of global merchandise trade. “Both Hong Kong and the UAE have what it takes to be a key commercial hub for the Belt and Road Initiative. Working together, we can build new business-to-business links along the Belt and Road and gain access to new markets,” Mr Liang added. The Belt and Road, together with the upcoming Expo 2020 Dubai, is expected to boost demand for trade, logistics, infrastructure, real estate and financial services in the UAE. Hong Kong and mainland companies can help fill the need by providing services and investment. The UAE is Hong Kong’s largest trading partner and export market in the Middle East. Bilateral trade between the two places grew at an average annual rate of 14 per cent from US$4.80 billion in 2010 to US$10.6 billion in 2016. Hong Kong’s exports to the UAE grew 13 per cent to US$6.8 billion last year, led by exports of pearls, precious and semi-precious stones (40.6% of total, up 32.1%), telecom equipment and parts (32.3% of total, up 23.8%), and jewellery (5% of total, up 36.5%). 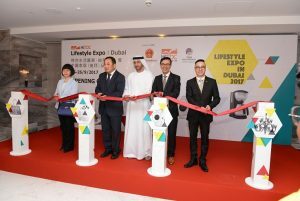 The Lifestyle Expo in Dubai 2017 features various networking events and activities, including the third Hub-to-Hub Business Meeting with business leaders from Hong Kong, the UAE and Africa discussing ways to capitalise on the latest market developments. Customised one-to-one business-matching services are being arranged to connect exhibitors and buyers. Products from 11 exhibitors are spotlighted at the hktdc.com Small Orders showcase, where buyers can place orders of between five and 1,000 pieces. The HKTDC Frequent Buyer Awards 2017 were presented yesterday to UAE companies that frequently visited the Council’s trade fairs in Hong Kong and Dubai. Mr Liang is in Dubai with a Hong Kong business mission representing a range of sectors, including electronics, fashion, housewares, gifts, stationery, packaging, toys and wellness products. The delegates are exploring collaboration opportunities with UAE companies, and will make a day trip to Sharjah and Ajman in the North Emirates region tomorrow. Highlighting Hong Kong’s position as Asia’s lifestyle trendsetter, the Lifestyle Expo is among the HKTDC’s signature international promotion events with a successful track record in fostering trade between companies from Hong Kong and emerging markets worldwide, including Russia, Poland, Turkey, India and Indonesia.